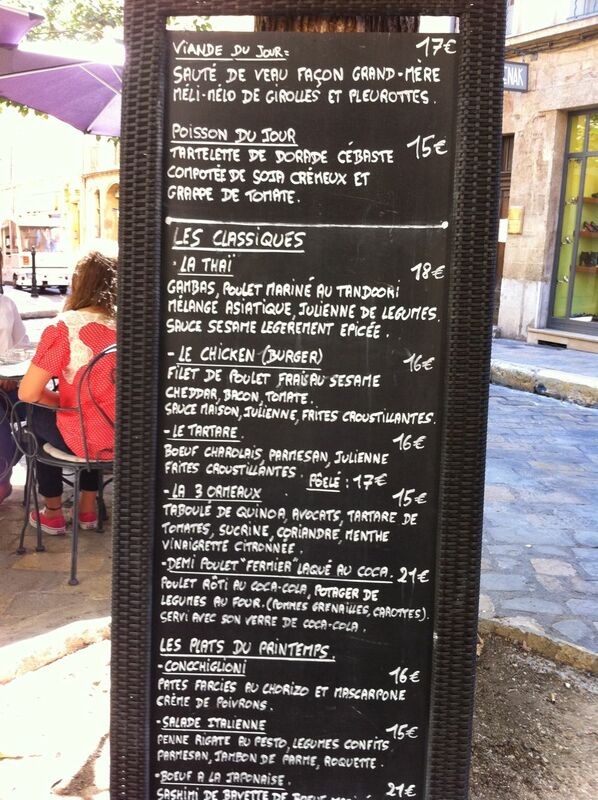 I while back I wrote one of my rare bad reviews for the Café le Verdun in AIx-en-Provence. That day, we ended up eating in the Café le Verdun (despite the rude Maitre d’) simply because the LSH and Ash had already ordered beer. 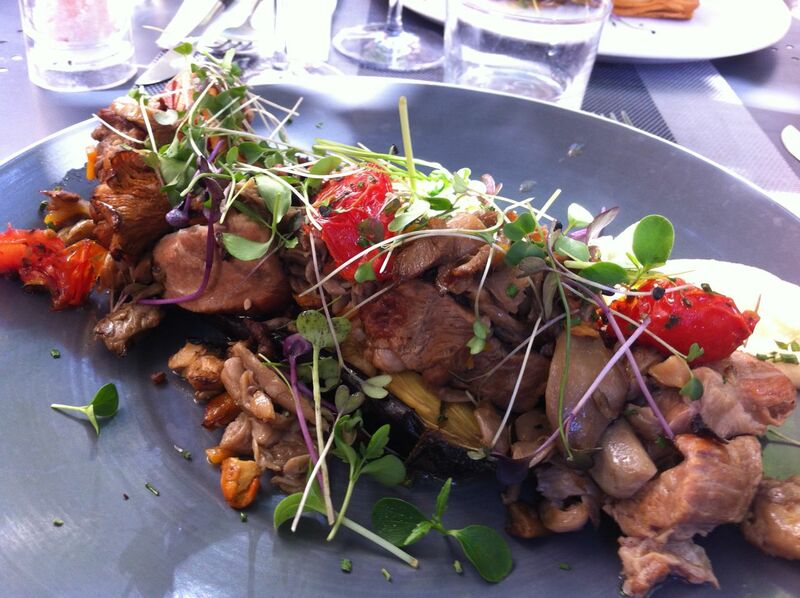 The eatery that the girls and I left to join them was l’Epicerie, in the Place les Trois Ormeaux. This week, we were in Aix again (doing Cultcher – visiting the art gallery) and the YD and I insisted we visit l’Epicerie. 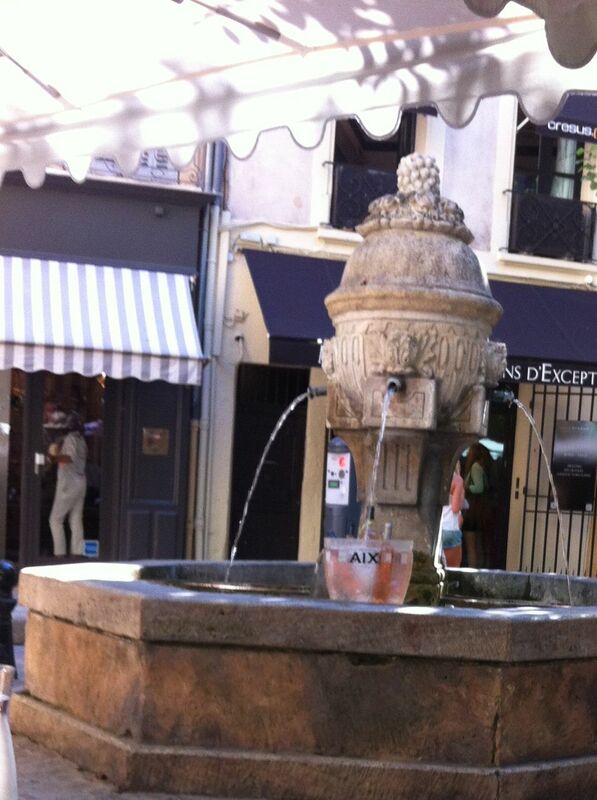 We had no idea what the food was like but they made good use of their local fountain! I have to confess we were all a bit stuffed after too much eating out (thanks Granny) so we held back on this occasion and just had one course each. 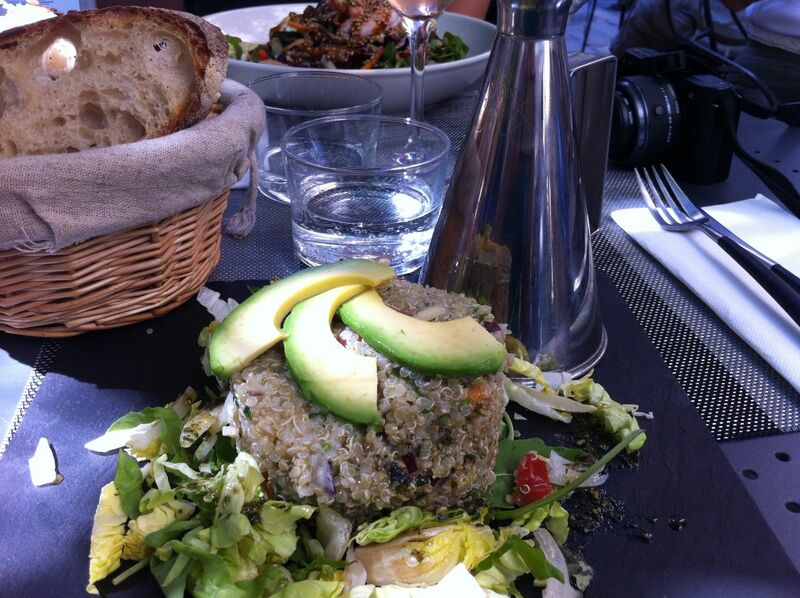 I held back even more than the others and went for the vegetarian option – La Trois Ormeaux; quinoa tabouleh with avocado, tomato tartare and some other bits and pieces. It was pretty good – and it was the weakest dish on the table! The YD, being fussy vegetarian, ordered the La Thaï. 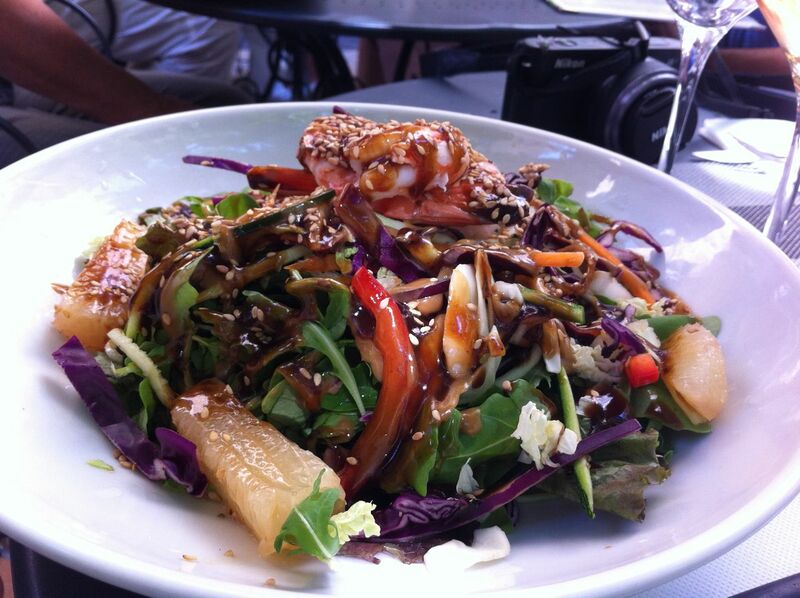 This was a Thai salad with prawns and tandoori chicken. 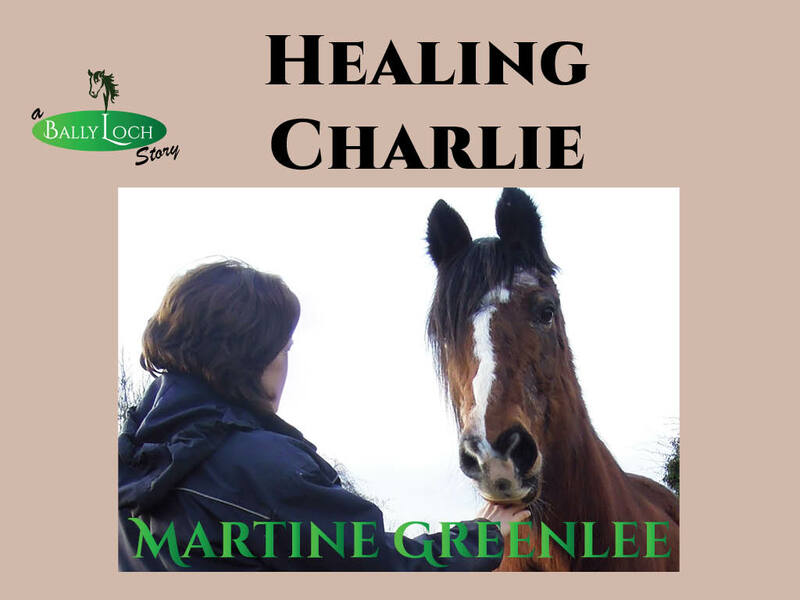 She asked them to hold the chicken, hoping for an extra prawn or too, but no, she got a meagre three prawns. Two ladies seated beside us also ordered La Thaï and theirs cam heaped with chicken. We felt it was a bit stingy of the staff not to compensate in some way for the lack of chicken, but otherwise the dish was delicious. 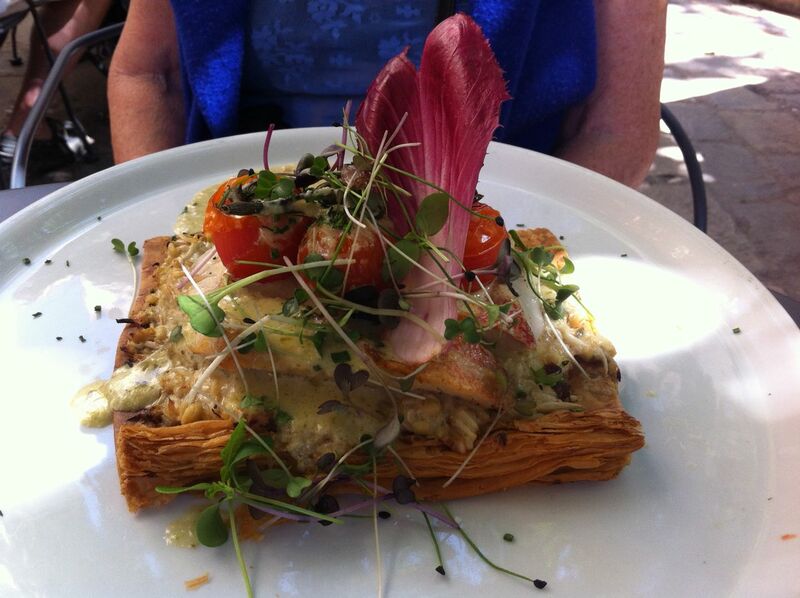 Granny’s meal was a close runner-up – sea-bream tartlet. A nice piece of fish sitting on flaky pastry, heaped with all sort of goodies – angel hair pasta, some sort of creamy stuff which we assumed was the competée de soja and various salady bits and pieces. Granny and the LSH ordered desserts (tarte tatin and lemon meringue) and we all ordered coffee. The desserts arrived (I forgot to take photos – they were large portions, not earth-shattering but ok flavourwise) and we waited for our coffee. And waited. And waited some more. And eventually asked about the coffee and were presented with the bill some time later. Eh? My French isn’t that bad! Fortunately the coffee was not on the bill! And so, l’Epicerie has the dubious distinction of being one of my rare reviews where the service was not great. Losing our coffee order on top of being rather miserly with the YD’s Thai salad brought an otherwise superb meal down.